If you’re inclined to be cynical about government, have a chat with James Lindgren ’15 (Marshalltown, Iowa), who just spent the summer working for the U.S. Secretary of Agriculture. He has only good things to say about the experience. That symposium led Lindgren to an internship with an NGO in Bangladesh, where he helped evaluate the success of a climate change and food security initiative. Although he lived in Dhaka, Lindgren spent significant time interviewing farmers, occasionally in their native Bangla, which he picked up on the job. 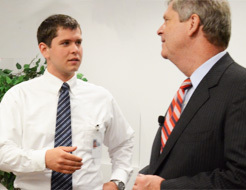 These experiences, in turn, led to Lindgren’s internship last summer at the USDA, in the office of Secretary of Agriculture Vilsack. There he reported to Director of Scheduling and Advance Sally Cluthe, who encouraged him to pursue the projects he found most interesting. Lindgren was soon immersed in issues of climate change, food access, and agricultural policy. Putting his knowledge and recent experience to good use, Lindgren co-chaired the Call to Action student committee at the college’s recent International Roundtable focused on the globalization of food.